Sweethome Ljubljana apartment is located in the city centre. That means that you can explore all the top city sights by foot. Excepts the Castle you will reach all of them in maximum 10 minutes walk. The heart of Ljubljana's social life are the Ljubljanica river embankments, densely scattered with lively cafés offering outdoor seating. A good way to see the old city centre and its famous bridges, picturesque buildings and vibrant embankments from a completely different angle is to join a tourist boat cruise along the river. In the summer you can hire a canoe and paddle through the city centre. 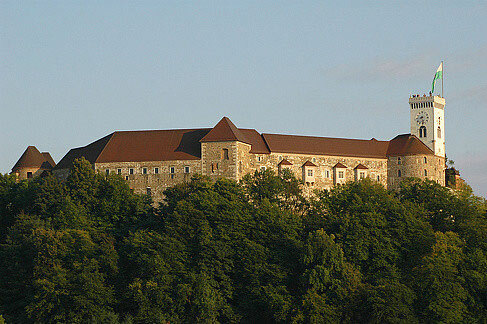 The Ljubljana Castle (Ljubljanski grad), the city’s most prominent landmark, is a medieval fort overlooking the old city centre. The castle has a lot to offer and numerous events are organized throughout the year. There is proven evidence that Ljubljana's castle hill, was inhabited as early as in the 12th century BC.The earliest evidence of a hilltop settlement are archaeological remains of the Urnfield culture. You can reach the top using one of the paths leading up from the old town – the most popular is from Stari trg - max 10 minutes walk, drive by car from Streliška street, drive by tourist train from Stritarjeva street or use the funicular from Krekov trg. 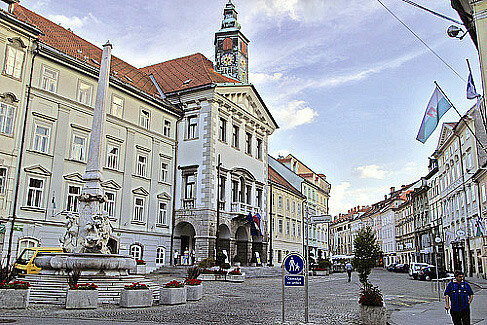 The Preseren square (Prešernov trg) and Franciscan Church (Frančiškanska cerkev), Preseren square is named after the greatest Slovene poet, France Prešeren (1800-1849). His poetry is a symbol of longing for love and freedom, which is why one of his poems, “Zdravljica ⁄ A Toast” became the national anthem. The monument to Prešeren was unveiled in the autumn of 1905 and is the work of architect Maks Fabiani and sculptor Ivan Zajc. The poet's statue is symbolically faced by the statue of Julija Primic, his great love, mounted on the fasade of a building located across the square, in the Wolfova ulica street. A lot of citizens use today the Preseren square as a meeting place. Dragon Bridge (Zmajski most) is often regarded as the most beautiful bridge produced by the Vienna Secession. It is the first bridge in Slovenia paved with asphalt, the first reinforced concrete bridge in Ljubljana, and one of Europe's earliest reinforced concrete bridges. When completed in 1901, it had the third largest arch in Europe at that time. 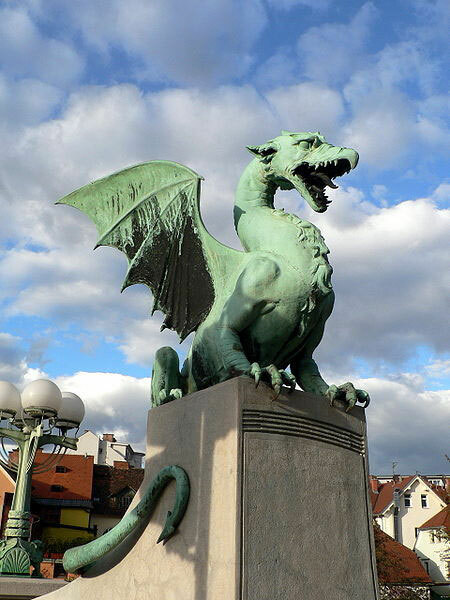 There is a legend that Jason was the founder of Ljubljana, and he and his Argonauts killed a dragon. This is one of the four dragon statues in the bridge. According to local legends, when a virgin crosses the bridge, the dragons will wag their tails. Some local people have nicknamed this structure "mother-in-law" because of its fiery nature. Triple bridge (Tromostovje), there is mention of a wooden bridge in this location from 1280, and which had to be built anew in 1657 after a fire. This was replaced in 1842 by a new stone bridge. It was extended into the Triple Bridge by the 1929 design of the Slovenian architect Jože Plečnik(1872–1957), who added pedestrian bridges on either side, effectively widening the bridge. Ljubljana Old Town - Mestni trg, Stari trg in Gornji trg (Town Square, Old Square and Upper Square), Ljubljana's Town Hall is used as the seat of the Municipality of Ljubljana. The Town Hall façade reflects Venetian architectural influences. In the Town Hall's arched courtyard stands Francesco Robba's Narcissus Fountain (Narcisov vodnjak). Next to the staircase there is a monument in memory of Ivan Hribar (1851-1941), a famous mayor of Ljubljana. In front of the building stands one of the most representative monuments in Ljubljana, the Robba fountain with allegorical sculptures of the three Carniolan Rivers the Sava, Krka and Ljubljanica. It was created in 1751 by Francesco Robba, the most important Ljubljana sculptor of the 18th century. Town square and Old square flow one into another and then into Gornji trg (Upper Square). All three, representing the Old Town, embrace the foot of Castle Hill. The houses are almost all Baroque only some, with their axes at right angles to the street, have retained their medieval layout. Just as the Cathedral dominates Mestni trg, so the Church of St Florian (1672) dominates Gornji trg. 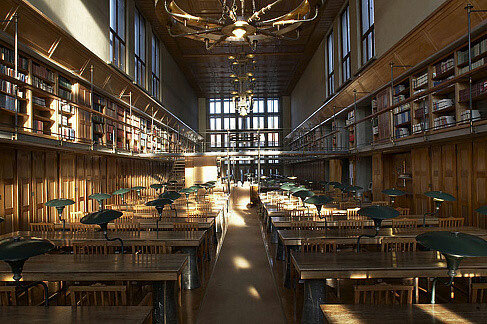 The National and University Library (NUK), whose archives contain, among other things, a rich collection of medieval manuscripts, incunabula and Renaissance prints, was built between 1936 and 1941 to designs by Jože Plečnik. It is considered to be the architect's most important work in Slovenia. Its characteristic façade, combining bricks and stone blocks in variable finishes, was modelled on Zuccari Palace (Palazzo Zuccari) in Rome. Each of the two handles on the main entrance door is decorated with a head of Pegasus, a winged horse symbolically guiding visitors to the realm of knowledge. From the vestibule, a door leads to the famous monumental central staircase with 32 pillars and further on to the library's grand reading room. The reading room's most outstanding details are Plečnik's chandeliers and a couple of glass walls allowing light to reach wooden reader desks and books from two sides. Nebotičnik (Skyscraper) is a prominent high-rise located in the centre of Ljubljana, and is one of the city's most recognizable landmarks. Its thirteen storey’s to a height of 70.35 m. It was designed by the Slovenian architect Vladimir Šubic for the Pension Institute, the building's investor. Construction began in July 1930 and the building opened on 21 February 1933. It was, upon completion, the tallest building in the Kingdom of Yugoslavia, and the ninth-tallest high-rise in Europe. It was and would remain for some time the tallest residential building in Europe. 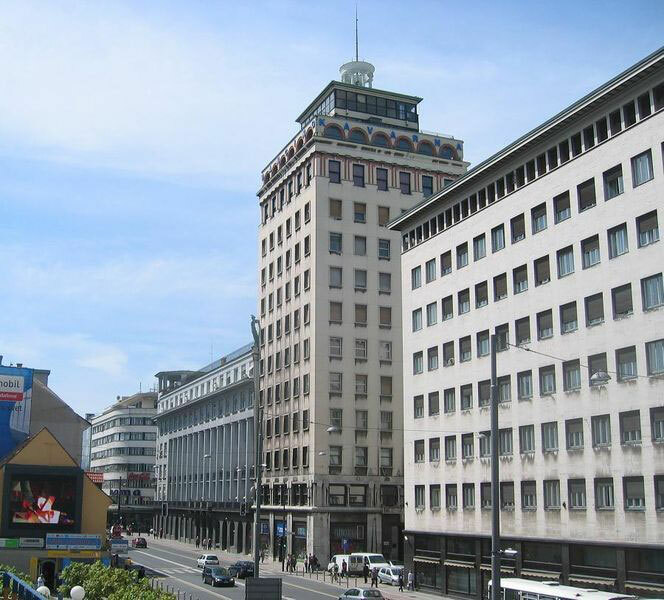 Nebotičnik is today home to a variety of shops on the ground floor and first story, various offices are located on floors two to five. The sixth to ninth floors are private residences. Located on the top three floors are a cafe, bar and observation desk.